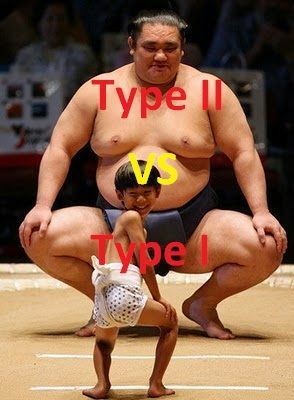 In type 1 diabetes, the body makes little or no insulin due to an overactive immune system. People with type 1 diabetes must take insulin every day. Type 1 diabetes usually occurs in children and young adults but can also appear in older adults. In type 2 diabetes, body prevents the insulin it does make from working right. Our body may make some insulin but not enough. Most people with diabetes—about 90% to 95%—have type 2. This kind of diabetes usually happens in people who are older, although even younger adults may be diagnosed with it. Type 2 diabetes also usually occurs in people who are overweight. In fact, about 8 out of 10 people with type 2 diabetes are overweight. A third type of diabetes, gestational diabetes, is a temporary condition that occurs during pregnancy. It affects approximately 2 to 4 % of all pregnancies (in the non-Aboriginal population) and involves an increased risk of gestational diabetes.